My name is Andrew Fischl and I was born in 1989. I didn’t pick up a sabre for the first time until the summer before my junior year and I am currently rated 6th in the country, which should be very encouraging for you late starters reading this. I am currently training and going to Stony Brook University for computer science while I try to make the USA World Team. My ultimate goal is to go to the Olympics. 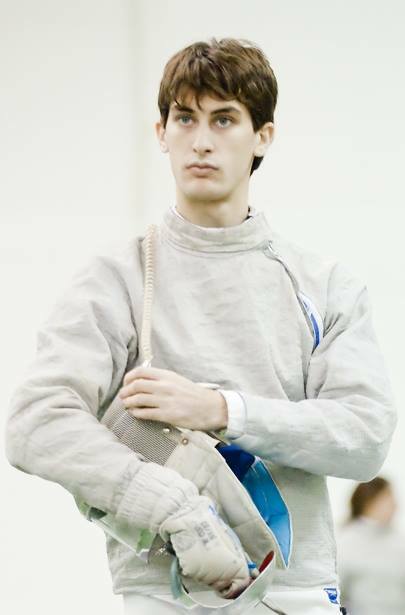 Before I started fencing I had tried many sports: I played soccer, tennis, baseball, lacrosse, etc but none of these sports really engaged me the way fencing did. I like the feeling of you and your opponent being so close to each other, learning as much as you can about each other, and really engaging each other in close quarters. At this distance you can really feel the impact each of your movements and decisions has and I really love that feeling. To many people my nom de guerre is CyrusofChaos. After being eliminated from my first DIV I NAC I walked around the room watching the high level of competition and noticed the complexity and nuances of all the things the top fencers were doing. Unfortunately the next day I couldn’t remember the very small things that I had enjoyed watching and wanting to try. I looked on Youtube for footage of fencing and found very little. I realized that there was no point in staying to watch these tournaments at all if I couldn’t remember what I wanted to try, so I picked up the family camera and started recording as many interesting bouts as I could. I realized other people might benefit from what I was filming so I started to upload my footage. I frequently analyze fencing through my video medium so when Jon asked me to write for his blog I was happy to share my point of view here too. I look forward to bringing more personalized content to you in the future!